The other day I came across this pretty crochet gauntlet tutorial by Melody. I loved the pattern, but couldn't see myself wearing something without a thumb hole. Thus inspired, I modified her free tutorial and then wrote my very own top "glove" portion to suit the modified square. I love both Melody's gloves and my own finished product. My glove is vastly different from hers, but I do owe her credit for sparking my creativity. 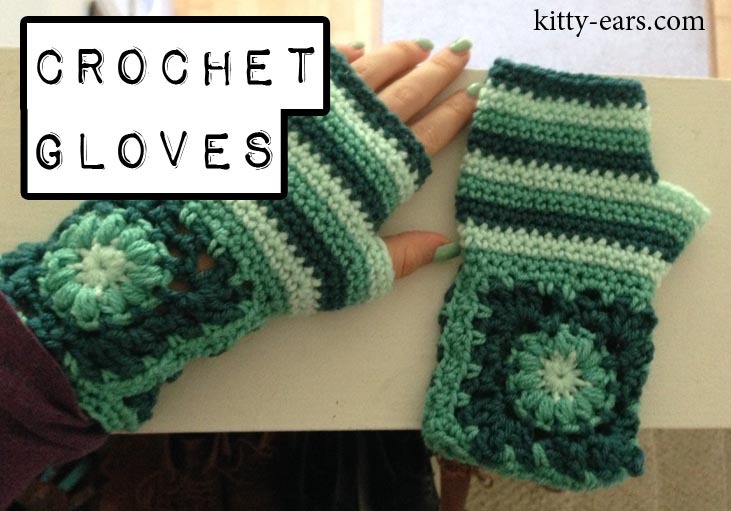 If you know how to crochet and want to make yourself a pair of these gloves, I made a YouTube tutorial. I am having such a fun time releasing two videos a week (one usually makes it to the blog) and...I now have one hundred subscribers on YouTube. I'm floored. Really. One annoying thing is that my video editing software will only allow me to upload videos that are under 15 minutes. This is annoying, since youtube has abolished the time limit--but my software has not had the restriction lifted. It was really hard to get this video under 15 minutes. Like, really hard. I deserve a reward. I'll see you guys later...also, let me know what kind of videos you would be interested in seeing from me in the future, since this video thing seems to be agreeing with me. It's so much fun.